Open the placemark. I believe this to be the location of your original photograph. My guess is that the picture was probably taken from the Storey Bridge at Circular Quay, looking up Boundary Street towards Spring Hill. The church is St Pauls Presbyterian, located at 53 St Pauls Tce Spring Hill. The picture shows the back of the church. 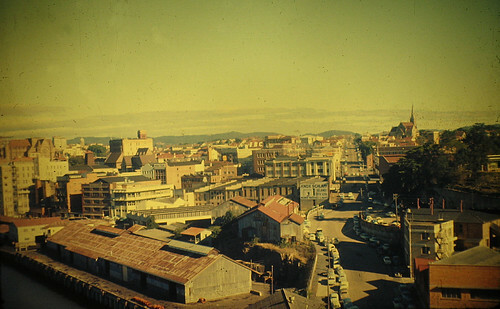 The first major intersection you can see in the picture is where Ann Street crosses Boundary Street. The road coming in from the right of the picture is Ivory street, which is still one of the exits off the Storey Bridge.